1. Setting the target EC: When making nutrient solutions, EC meters are useful for setting the target EC. 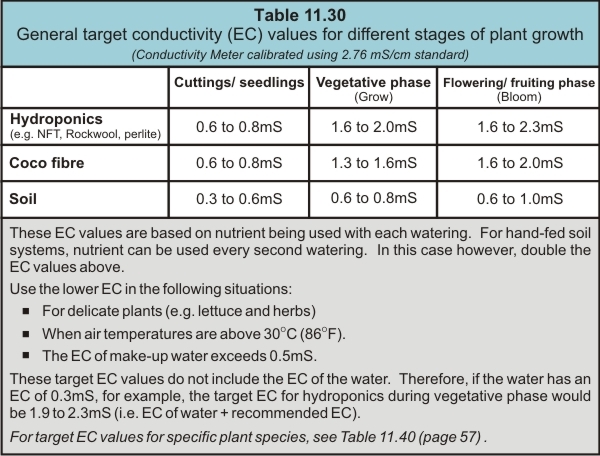 The EC requirement depends on factors such as the stage of plant growth and the type of medium. Burning of roots or foliage can occur if the EC is too high. If the EC is too low, deficiency symptoms can occur. 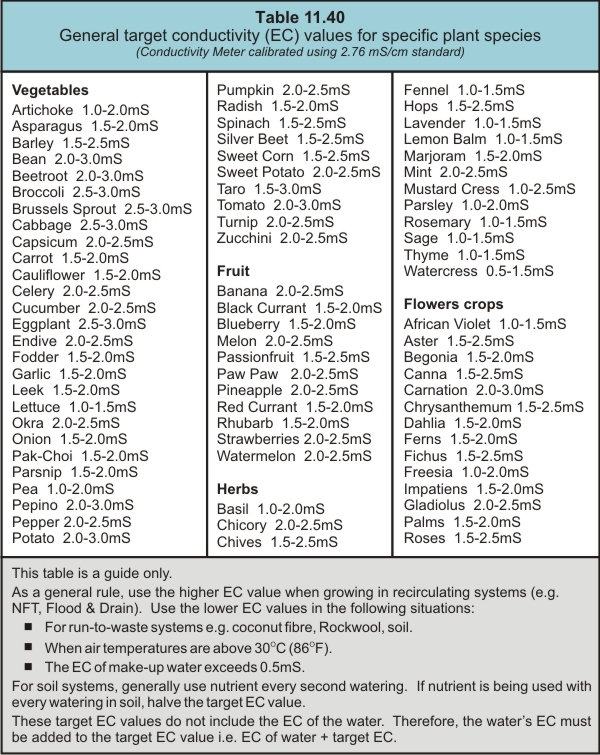 Refer to Table 11.30 for commonly recommended EC levels for the main stages of growth. There is no need to be precise with EC levels because plants will generally only consume what they need. Most plant species will tolerate being above or below the recommended value by at least 10%. The target EC values in Table 11.30 do not include the EC of the make-up water. The EC of the water must be added to the target value. For example, if the recommended target EC is 2.0mS/cm and the water has an EC of 0.3mS/cm, the EC should be set to 2.3mS/cm (i.e. 2.0mS/cm + 0.3mS/cm). For further information on this concept see “Concentration effect”. 2. Maintaining the target EC in recirculating systems: EC meters are useful for monitoring and maintaining the EC as nutrient and water are consumed. If the EC is too low, concentrated nutrient will need to be added to prevent the risk of the solution becoming depleted in any one nutrient element. Be aware that the EC reading is a “gross” figure. It will not warn of an imbalance of nutrient salts, or the accumulation of toxic or nuisance salts (e.g. sodium chloride) which are often present in the top-up water. Therefore, as a precaution, the recirculating nutrient must be frequently discarded and replaced. Step 1. Check the meter’s calibration using a reputable conductivity standard solution. Step 2. Stir the nutrient reservoir thoroughly before sampling. Ensure the sampling container is clean by rinsing a few times with the nutrient solution. For recirculating systems, it is easier to interpret EC readings by always ensuring the reservoir is filled to the same volume before taking the sample i.e. if the reservoir level has dropped to half, then the EC reading will be twice as high as what it would be when full (assuming the top-up water contains nil salts). Step 3. Rinse the electrode in distilled water then remove any excess water by either gently shaking, or wiping with a tissue. Immerse the electrode in the sample and wait a few minutes** before switching the meter on and recording the EC (Fig 11.3). ** Wait longer if the sample’s temperature is significantly different from ambient. a) If the EC is below target: Add nutrient until the target is reached (do not use additives for this purpose). To calculate this volume mathematically, refer to Table 18.50.
b) If the EC is well above target: Add more water (“top-up” water). To calculate this volume mathematically, refer to Table 18.60. Step 5. When finished, rinse the electrode with distilled water. Store the electrode in distilled water when not in use.